To get Max’s CAI set working in FSX move a copy of FSSound.dll, SOARRec.dll, SOARRec.log and any copy of a GPS-NAV.dat into the main FSX folder. On startup the program asks whether to start both dlls and whether they should become trusted software. Answer in the affirmative. You can then click on the buttons on both the gps-nav and the variometer to get these working. FSZweverview2.exe should also be put into the main FSX directory and this will then load the gps-nav which should be situated in the gauges folder. These remarks apply to mr_fs9_caiset.gau , which is what I use. I am downloading all Wolfgang’s gliders again to start fresh in FSX and will amend all the panel.cfg files if they need it. 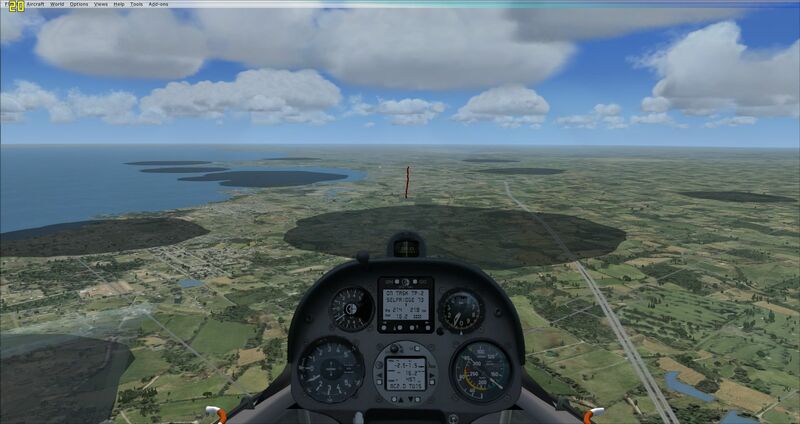 You can test the variometer by going into tutorial 7 and altering Tutorial07.FLT to get rid of the DG and putting in the sailplane of your choice (aircraft title from the aircraft.cfg file). This mission has thermal, ridge and wave lift in it and rotor at the back of the hills so you can give the gauge a good thrash. So Max, if you are reading this, thanks yet again for your work. Anyone know the *best* add-on competition glider for FSX? I know that's a subjective term but I mean whichever add-on glider that has the most complete feature set - decent 3d model, instruments, virtual cockpit, sound. I'd prefer standard or 15m but hey I'm nearly old enough for open class. The fsglider.de LS8-18 seems to resolve all these issues except the TE vario - for that I'm guessing I'd need to do a custom install of max's guages and modify the LS8-18 panel. The LS8-18 airbrakes don't feel quite right but they're better than the DG. The LS8 has no flaps so that problem doesn't appear. LS8 doesn't seem to have waterballast though. Is that the state of the art for gliders in FSX? Is it right FSUIPC is required, even if only the vario is used out of the package? I editted the LS8 panel to remove the GPS and the LNAV, figuring I could live without the logger and use the stock FSX gps, but was just trying to get a compensated vario. The whole idea is to get a compensated vario in the LS8-18, but I'm not sure I should need to install FSUIPC for that?? From my reading of the LNAV, the correct polar needs to be in the LNAV_polarlist.dat file to get the most accurate information. The default file has the ASW20 polar. There is also a polarlist file, which contains a few more. I was also able to find a table online which had yet a few more polars for the LNAV, however, it's hard to find the ones to match up with the most current FSX gliders, specifically the DG-808S. Well, I found Wolfgang Piper's little program, PolarCalc 1.02, and, as well as having LNAV polar text for all his gliders, might also let you generate polars by feeding it the results of a test flight. Good luck with the CAISET. Which glider are you trying it in? You seen documentation e.g. here at UKVGA? When you've had some success with the CAISET, please report in. Hurdles to overcome include setting the polar, sharing of a task, and getting reliable IGC files. Maybe you'll create a good hybrid of the LNAV with the FSX GPSNAV and sim_logger. I'll be genuinely interested to hear what was *better* about the CAISET than the instruments in the ASW28. I'm currently doing a similar job on Wolfgang Piper's LS8-18. LOL! It's all new to me, my friend! Keep an eye out for some more "zombies"! Seriosly though, I spent most of the day reading about LNAV polars and one of my Google hits was this post. At least I was on topic, eh? I have installed the ASW28, but not flown it yet, we've only been using the SOAR DG so far. What appears better about the CAISet (without having actually flown with them yet) is it looks clearer to read than the FSX GPS, *and* it has Speed-to-fly indicator. As you mention, though, the problem is finding, or making, a polar string for the LNAV. FSZwever2 has a function to read a list of saved polars, and send a selected one to the LNAV_polar.dat with click of a button. What we'll probably end up doing is using CAISet for GPS navigation and LNAV for glide computer, but stick with your Winter TE vario and sim_logger for IGC...I don't know, we'll see. I haven't chosen a glider yet with CAISet...maybe the LS8-18, since it comes with the LNAV polar. I also spent some time reading about panel.cfg. I'm going to try substituting the CAISet for the GPS and Cambridge in the SOAR DG, since we are confident of the flight model in that airplane. But, just need to find or create a polar string for the LNAV. Getting close! Wolfgang last updated the LS18-8 as recently as August of this year, and it still has your gauges. I just had a quick look at the virtual cockpit today, and the CAISet is much clearer and easier to read than the FSX GPSnav. I have no idea what's involved in making a new one from scratch. That's because I wrote those gauges with readability in mind and MS didn't. If I could be bothered I could tweak the other values. The fact is (a) the MS 'quartz' font is poor, and ( b ) FSX isn't rendering it at small sizes very well at all. Is there a technique that fixes this issue? p.s. I've been doodling a speed-to-fly formula for the LCD vario over Christmas, and intend to put that into the LS8-18 so it will have te, netto and stf varios. Using bigger bitmaps for the gauges might be a help - most of Wolfgang's instruments are on 315 x 315 bitmaps (mine too...). Those MS bitmaps are way too small - 100 x 100. Better contrast between bitmap and text is helpful too - black on white still works best. I'm constantly improving upon my methods for generating polars. The polars I'm posting may change from week to week if I feel I've made more accurate measurements. I'm finding that the L-Nav really can work very nicely if the polar is just right. slightly different way of expressing the LAT and LON coordinates. Nonetheless, they seem to work OK. Does the CAISet handle either way, then? I'm finding that the L-Nav really can work very nicely if the polar is just right. And there's the problem: how to get a 'right' polar. I once did a program to find just that. It was rather funny, setting up 10 PC's with FS2k2 and my polar flying software only to find out that different PC's gave all different results. (You should have seen the office with all those desktops running FS on a saterday morning - those were the days...). It took months to get it - more or less - right; and then a new version of FS came around and everything stopped working so all the fun started again. One odd thing I noticed, when I'm cruising, and fly through lift, the "height above goal" readout will actually go down, whereas I would expect it to go up. I can only think it is because I'm not slowing down for the lift. Eventually, it seems to recalculate and then show the extra height above goal I gained in the lift. But even if I stop to circle, while circling in lift it will often show a negative number for height above goal. Hey B21, I never thought to ask this before, and don't understand why I didn't, but does your guages use the same GPS-NAV.dat file? Hi Scott, yes - among other things I couldn't solve at the time. I'll see if I can find some of this stuff on one of the (very) old hard disks I've lying around - nothing of it is on my current computer. So Max, that must be why you didn't include the polar function in the updated version of the FSZwever View program. The version I downloaded has the polar function, at least the function to load the list of polars from LNAV_polarlist.dat, select one, and send it to LNAV_polar.dat. One problem I've noticed is that some polars that ship with a glider are corrupted from the get go, and need to do some hand editing. Not to speak for B21, but I'm certain his guages are picking up nav data from the .FLT fie, same as the FSX gpsnav does. Plus, I assume, his arrival height instrument is getting polar data directly from FSX for whatever glider you are flying, I don't know. I'm pleased to hear he's working on a speed-to-fly indicator. It would be great to have that and not have to depend on a 'dodgy' polar. The Speed-to-Fly in Max's CAISet works like a charm, *if* you can be sure to get the correct polar! If I knew the best methodology for getting a polar from an FSX flight test, I would try to do it myself. Thanks! And I even own that book! CAISet still have lots of life in them, IMHO, a tribute to your work. FYI my GPSNAV is just a tweaked version of the FSX one, and it uses the waypoints in the current FSX flightplan. The '302' computer vario also uses the FSX flightplan, to pick up distance and bearing to the next waypoint to compute arrival height. I.e. I use the FSX flightplan, not a gps-nav.dat file. That's looking really good, Ian! Looking forward to trying this out! FYI, that is the way Condor handles STF, toggle the vario to STF mode, then centre the needle on zero. Very intuitive, IMO. I'm curious now, about how you handle the polar. What polar are you using, and does that mean the gauge is then specific to a particular glider? I.e., you would have a separate gauge for each glider, placed in the aircraft folder, rather than the generic gauges folder? It's looking much better already - have you tried another font yet ? There's a Quartz Bold font available on the internet. Does this mean that YOU have to create different gauges for every sailplane WE want to fly? Can't you just load something like a polar file? shows '0' when empty and '100' when full. If you wanted you could have the '302' gauge in the Gauges folder and just the b21_polar.xml nested with the SimObject, but with the complexity of my panels, and inter-dependency between the gauges, it makes more sense to have the gauges held within the SimObject folder structure. The entire '302' vario is only 108KB.